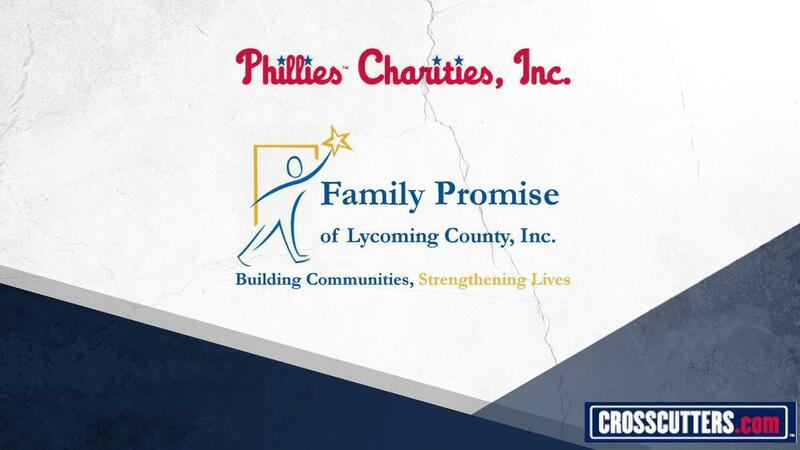 The Philadelphia Phillies recently announced that their charity arm, Phillies, Charities, Inc., has awarded a $15,000 grant to Family Promise of Lycoming County. Family Promise of Lycoming County brings the community together to help families regain their housing, their independence, and their dignity. Family Promise aims to help children and their families who are facing homelessness. "Each year, Phillies Charities reaches out to us to provide information about worthy charities in our area," said Sarah Budd the Crosscutters Director of Ticket Operations & Community Relations. "We are elated they chose to support Family Promise of Lycoming County, an organization with a great track record of success in our community." Family Promise Director Jenny Hull stated, "Family Promise of Lycoming County is so grateful and humbled to receive this wonderful gift from Phillies Charities. With this significant contribution we are able to continue to serve homeless families and provide services to the children of Lycoming County." Representatives from Family Promise, accompanied by Crosscutters representatives, will be in attendance on Thursday, December 6, at the Phillies Charities, Inc. Holiday Giving Party at Citizens Bank Park, where they will be recognized and saluted along with other award recipients by the organization for their charitable efforts. In the past year, more than $1.2 million was awarded by Phillies Charities, Inc. to charitable organizations in Pennsylvania, New Jersey, Delaware and near the Phillies spring training and minor league affiliates. Phillies Charities, Inc. serves as the fundraising arm of the Phillies organization and awards grants to a variety of charitable organizations each year. For more information on Phillies Charities, Inc. please visit www.phillies.com/community.